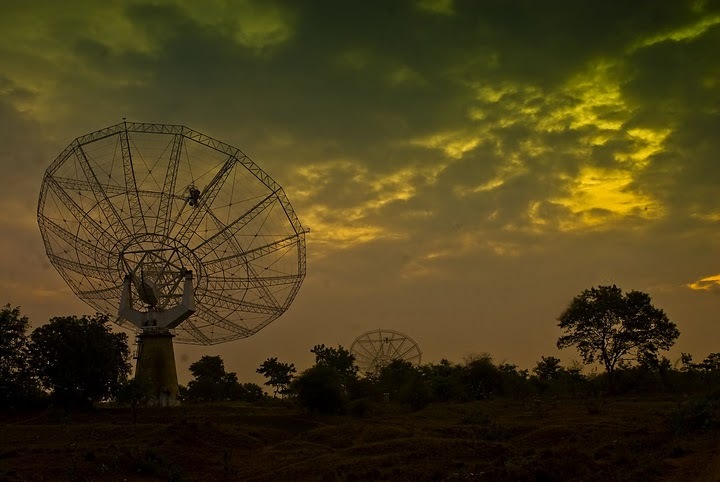 NCRA has set up a unique facility for radio astronomical research using the metrewavelengths range of the radio spectrum, known as the Giant Metrewave Radio Telescope (GMRT), it is located at a site about 80 km north of Pune. GMRT consists of 30 fully steerable gigantic parabolic dishes of 45m diameter each spread over distances of upto 25 km. GMRT is one of the most challenging experimental programmes in basic sciences undertaken by Indian scientists and engineers. WHY METRE WAVELENGTH : The metre wavelength part of the radio spectrum has been particularly chosen for study with GMRT because man-made radio interference is considerably lower in this part of the spectrum in India. Although there are many outstanding astrophysics problems which are best studied at metre wavelengths, there has, so far, been no large facility anywhere in the world to exploit this part of the spectrum for astrophysical research. SITE : The Site for GMRT, about 10 km east of Narayangaon town on the Pune-Nasik highway, was selected after an extensive search in many parts of India, considering several important criteria such as low man-made radio noise, availability of good communication, vicinity of industrial, educational and other infrastructure and,a geographical latitude sufficiently north of the geomagnetic equator in order to have a reasonably quiet ionosphere and yet be able to observe a good part of the southern sky as well. ANTENNA CONFIGURATION : The number and configuration of the dishes was optimized to meet the principal astrophysical objectives which require sensitivity at high angular resolution as well as ability to image radio emission from diffuse extended regions. Fourteen of the thirty dishes are located more or less randomly in a compact Central Array in a region of about 1 sq km. The remaining sixteen dishes are spread out along the 3 arms of an approximately `Y'-Shaped configuration over a much larger region, with the longest interferometric baseline of about 25 km. The multiplication or correlation of radio signals from all the 435 possible pairs of antennas or interferometers over several hours will thus enable radio images of celestial objects to be synthesized with a resolution equivalent to that obtainable with a single gigantic dish 25 kilometre in diameter! The array will operate in six frequency bands centred around 50, 153, 233, 325, 610 and 1420 MHz. All these feeds provide dual polarization outputs. In some configurations, dual-frequency observations are also possible. The highest angular resolution achievable will range from about 60 arcsec at the lowest frequencies to about 2 arcsec at 1.4 GHz. DESIGN BREAKTHROUGH : GMRT is an indigenous project. The construction of 30 large dishes at a relatively small cost has been possible due to an important technological breakthrough achieved by Indian Scientists and Engineers in the design of light-weight, low-cost dishes. The design is based on what is being called the `SMART' concept - for Stretch Mesh Attached to Rope Trusses. The dish has been made light-weight and of low solidity by replacing the conventional back-up structure by a series of rope trusses (made of thin stainless steel wire ropes) stretched between 16 parabolic frames made of tubular steel. The wire ropes are tensioned suitably to make a mosaic of plane facets approximating a parabolic surface. A light-weight thin wire mesh (made of 0.55 mm diameter stainless steel wire) with a grid size varying from 10 X 10 mm in the central part of the dish to 20 X 20 mm in the outer parts, stretched over the rope truss facets forms the reflecting surface of the dish. The low-solidity design cuts down the wind forces by a large factor and is particularly suited to Indian conditions where there is no snowfall in the plains. The overall windforces and the resulting torques for a 45-m GMRT dish are similar to those for only a 22-m dish of conventional design, thus resulting in substantial savings in cost. The dish is connected to a `cradle' which is supported by two elevation bearings on a yoke placed on a 3.6 m diameter slewing-ring bearing secured on the top of a 15 metre high concrete tower. The weight of the disk is about 80 tonnes and the counter-weight is about 40 tonnes. The dishes have alt-azimuth mount. The salient parameters and specifications of each dish are summarized in the Table. The large size of the parabolic dishes implies that GMRT will have over three times the collecting area of the Very Large Array (VLA) in New Mexico, USA which consists of 27 antennas of 25 m diameter and is presently the world's largest aperture synthesis telescope operating at centimetre wavelengths. At 327 MHz, GMRT will be about 8 times more sensitive than VLA because of the larger collecting area, higher efficiency of the antennas and a substantially wider usable bandwidth because of the low level of man-made radio interference in India. Electronic Frontends and Backends : Apart from the novel low-cost design of the parabolic dishes, the instrument has state-of-the-art electronics systems developed indigenously and consisting of the following main sub units. Antenna feeds at six different frequency bands between 50 MHz and 1500 MHz, having good polarization characteristics as well as simultaneous multiband operation. Low-noise amplifiers, local oscillator synthesizers, mixers, IF amplifiers. Optical fibres linking the entire array with the CEB. These are used both for the telemetry signals and local oscillator phase reference communication between the CEB and each antenna base. The status report of GMRT as of June 1999. The status report of GMRT as of January 1996. G.Swarup, S.Ananthakrishnan, V.K.Kapahi, A.P.Rao, C.R.Subrahmanya, V.K.Kulkarni, 1991, Current Science, Vol 60, No 2. Technical Reports kept in the GMRT/NCRA Library.